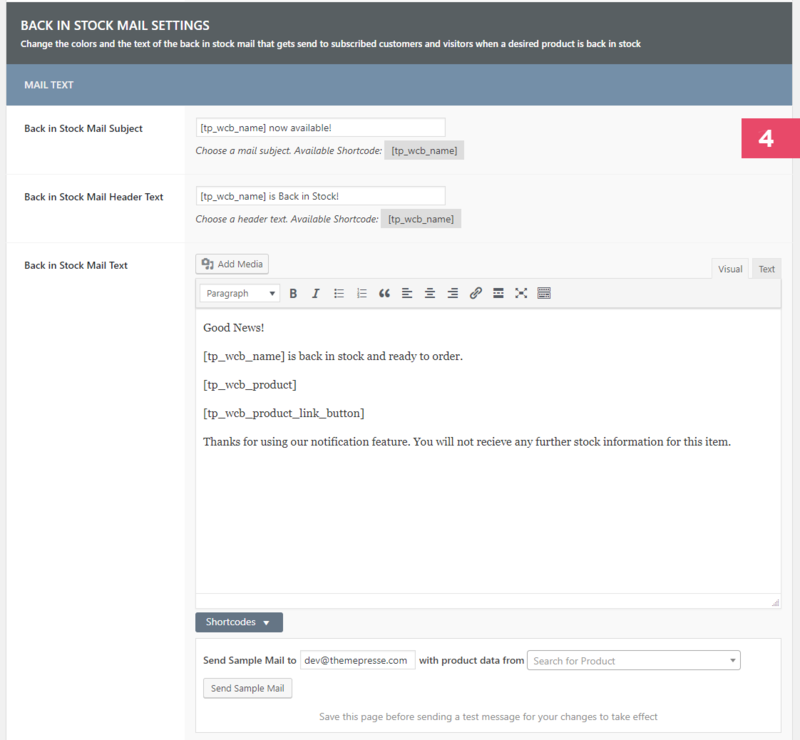 The mail settings enable you to change the text and style of the mails that get sent out automatically by the stock notifications part of the Conversion Booster Tools plugin. The first type of mail that you can edit in this section is the activation mail that gets sent out to visitors subscribing to out of stock products with their email address. There are two types of mails that get sent out by the stock notification feature. One that lets visitors activate a notification and one that informs customers as well as visitors if a product is back in stock. Here you can specify the subject of your mail. You can use the shortcode [tp_wcb_name] inside of the subject line to display the name of the product the visitor subscribed to. Changes the header text inside of the mails. This field also accepts the shortcode [tp_wcb_name] which displays the name of the product. This section lets you sent out a sample mail to an email address of your choice. By default the site admins email address will be preselected. 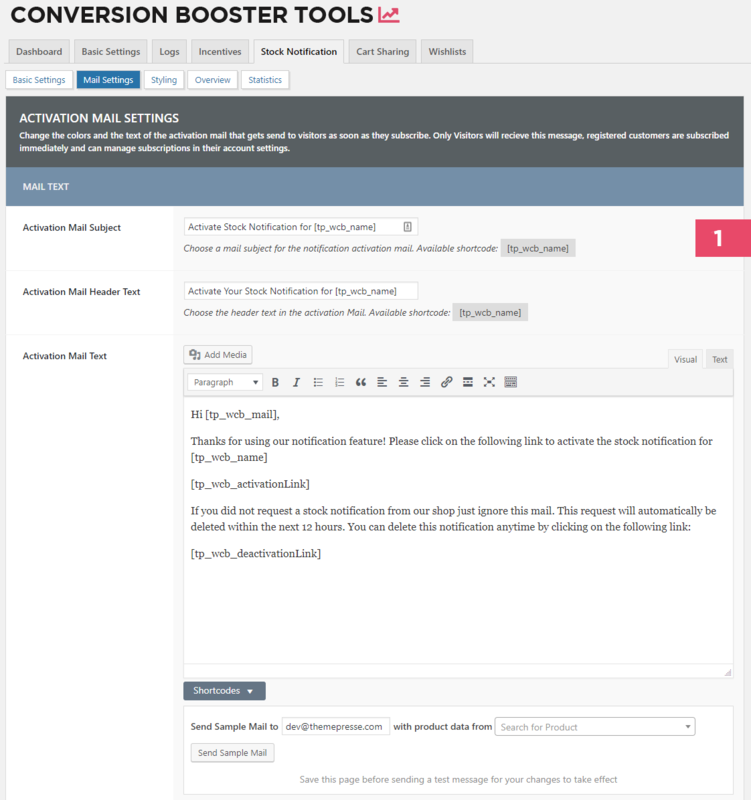 Before sending out a sample mail its necessary to save the current page for the changes to take effect in the sample mail. In this particular sample mail field the script needs an email as well as a product that should be used to generate the shortcodes. by clicking on the „Send Sample Mail“- button the email will be sent. 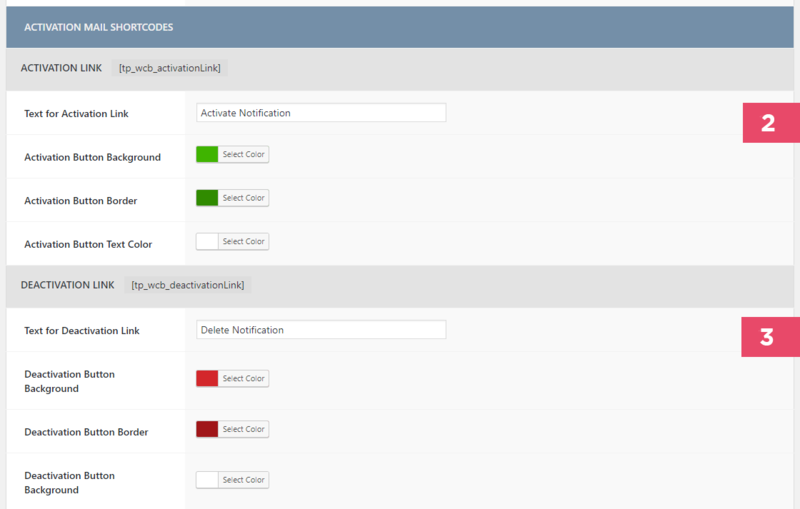 Right after the configuration of the mail texts you can change the look of the activation and deactivation buttons. The fields here are pretty self explanatory. You can change colors and the texts beeing displayed inside of your buttons. As usual you are able to send out a sample mail to an email address of your choosing. Please remember to save the current page before sending out a sample mail so that your changes take effect. 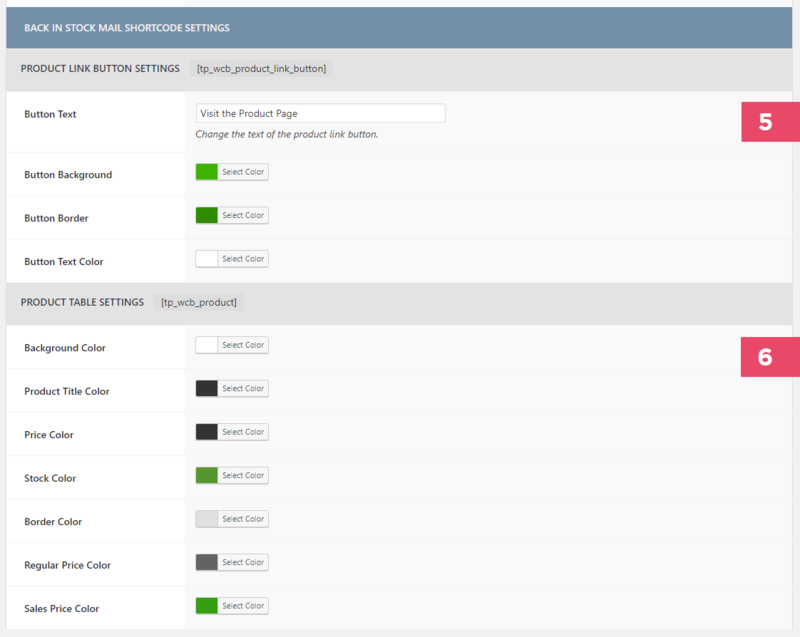 At the end of the mail settings you have the option to change the colors used within the shortcodes to display a button linking to the product page and the product table. These settings are pretty straight forward so we will not go into more details here.